GBP at risk of GDP release. FOMC in focus – The British pound has edged strongly higher over the past few days but could under risk ahead of the initial GDP estimates for Q1, which could see some pullbacks across GBP crosses. Following the GDP data, the markets will no doubt be waiting for this evening’s FOMC statement. 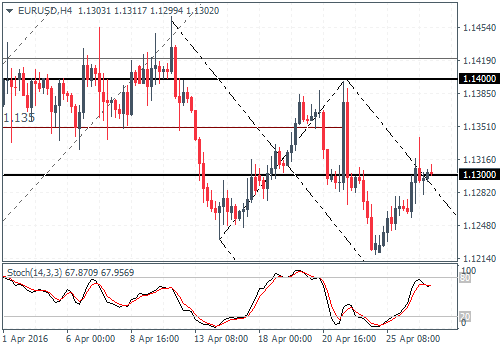 EURUSD (1.13): EURUSD is bouncing back with prices closing near the 1.13 handle yesterday. However, this is a level of minor resistance which could see prices struggle to break higher, but in the event of a close above 1.130, further upside could be extended towards 1.140, which could be seen if EURUSD attempts to breakout higher from the outer median line. To the downside, 1.120 is a clear support level which could hold prices in the near term. 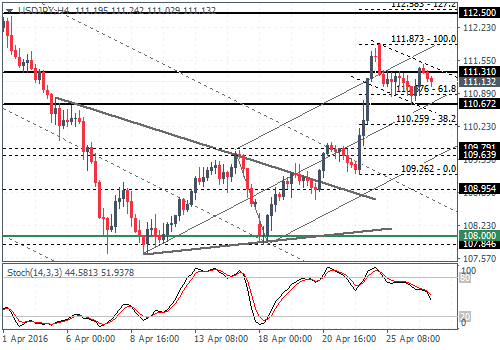 USDJPY (111.0): USDJPY price action was muted yesterday, but the bias still remains to the downside. A daily close below 110.67 could see further declines to 109 – 109.5 region. However, on the 4-hour chart, there is a potential bullish flag taking shape, where an upside breakout above 111.31 – 111.50 could extend gains to 112.50 initially followed by a rally to the previous resistance level at 114.7 – 114.35. The bullish bias could be invalidated if USDJPY drops below 110.67 in which case we can expect a test of previous support at 109. 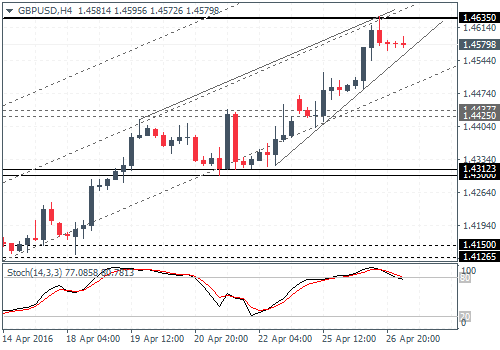 GBPUSD (1.45): GBPUSD continues to surge ahead with prices briefly trading near 1.4635 yesterday, having cleared the 1.4425 resistance, which could be tested for support in the near term. On the 4-hour chart, price action continues to trade within the evolving rising wedge pattern, a breakout of which could see a dip to 1.4312 – 1.43 on a break below 1.443 – 1.4425 higher support. Alternately, clearing the resistance above at 1.4635 could see further gains in store. XAUUSD (1243): Gold prices are backing attempting to recover the lost ground with minor support at 1231 being established. Resistance is identified at 1250 – 1243 levels and with the hidden divergence currently on the 4-hour chart, Gold prices are likely to dip lower in the term ahead of further moves to the upside. 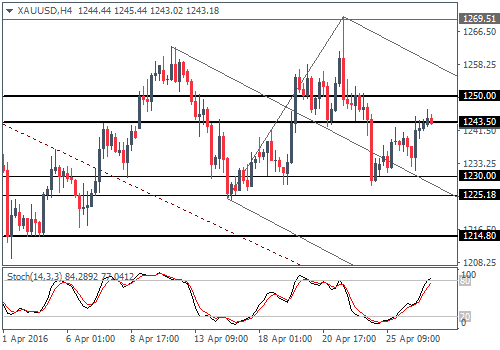 Above 1250, gold could test the 1260 resistance which could see a potential start of a new bearish trend.